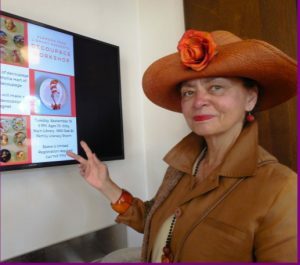 Last year, Library Director Jane Chisaki requested digital flat screens for each library to update patrons on events, programs, and calendar changes. The cost including installation, was about $10,000. The Friends’ “Ten Years, Already? !” campaign (celebrating the first decade of the new Main Library) raised the money. Now the installations are complete, thanks to the skill of Si Lewis from Alameda’s own Hidden Connections. The screens save on paper that would be used to print flyers and the displays’ color and movement is visually interesting to library-goers. Librarians thanked the Friends for their generosity in providing a device so up-to-date and useful to both staff and library users.